Tartu is home to a lot of smartness. Often called the intellectual capital of Estonia, Tartu is a town of intellectuals, scientists, creatives and students, making it a hotbed for creative and scientific culture. The nation’s most renowned university, the University of Tartu, hosts nearly 14,000 students, which makes up a good proportion of the whole population of the town – in total 100,000. This means the historic university town is always full of youth, life and new ideas which are turned into high-tech start-ups and companies. Also known as the City of Good Thoughts, Tartu already has a good track record as a smart city. Tartu has developed its e-services and paperless administration practices for decades and has been one of the first in the world to implement many smart solutions – m-parking in 2000, public Wi-Fi throughout the city in 2000, local e-elections in 2005, city mobile applications in 2006, digital signature in 2007, a fully electric taxi service in 2012, and participative budgeting in 2013 etc. Tartu ranks 15th in the European Smart Cities benchmark for smart people and joined the Covenant of Mayors in 2014 with the aim of promoting energy efficient solutions, the use of renewable energy and environmentally aware citizens. Engage the citizens in creating a high quality living environment that inspires environmentally aware decisions and new patterns of behaviour. Private initiative leads to installing devices that produce electricity from solar power in the amount of 2 MW. The main idea of retrofitting activities in Tartu is to turn the Soviet-time “khrushchyovkas” into “smartovkas” that offer an energy-efficient and high-quality living environment to the pilot area residents. 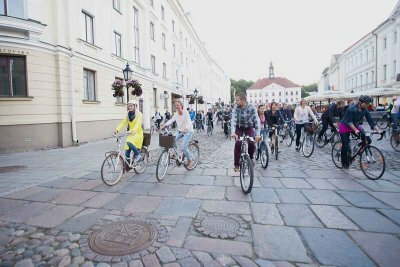 As an additional mobility solution that the City of Tartu will itself fund, an electric bike sharing system will be set up, including 65 parking locations spanning across the entire city for maximum use and comfort. In addition to fully renovating its pilot area buildings, the City of Tartu organized an international art competition for finding artists who will create unique artworks for the pilot building facades. The University of Tartu will conduct a study on the pilot area residents’ attitudes towards technologies and the environment, exploring aspects like environmental awareness, actual behaviour and consumption patterns. A number of social innovation models will be experimented with in Tartu in order to facilitate behavioural change and mutual learning among the residents of the pilot area and Tartu as a whole.